The Graco Premium Foam Crib & Toddler Bed Mattress is an excellent choice for your needs (Also see our best crib mattress reviews here), both in terms of price and quality/performance. Having been designed to fit any US standard-sized crib or toddler’s bed, the toddler foam mattress comes neatly and unobtrusively packed in a comparatively small, very light package, thus making it extremely easy for anyone to manage. Getting the mattress out ready to be decompressed is fairly easy and you need only follow the simple, step-by-step instructions. In fact, the Graco baby mattress will begin expanding into its normal shape almost instantaneously, although you need to give it a reasonable amount of time to completely expand before using it. The Graco is made of durable, high-breathability foam that can last for a long time while giving your kids all the firmness, comfort and restful sleep they so richly deserve. Although the Graco premium foam crib mattress isn’t organic, it is nevertheless made using relatively safe materials. In fact, this mattress doesn’t contain any latex, as some of its competitors do and it is made in the US by Storkcraft Inc. The main material in this mattress is polyethylene foam, which has been around for a long time and is used commonly in many products for both adults and children. This foam crib mattress doesn’t contain many of the nasty chemicals found in cheaper alternatives, including potentially allergy-inducing latex. This memory foam toddler mattress comes neatly and compactly packed ready for decompression. There is little for you to do, in fact, once you take it out of its protective wrapping, except giving it enough time to decompress. The Graco Premium foam crib and toddler bed mattress can boast of not being made using lead, phthalates, or a whole bunch of other nasty, potentially harmful chemicals. In fact, this mattress is made using anti-microbial and anti-static substances—all in all, offering your child one of the best levels of safety available today for the price you will pay. Finally, this mattress meets with federal posted flammability standards. Weighing a mere 7 pounds, the Graco crib mattress is super lightweight, thus making it super easy to handle, take out for airing and simply manoeuvring so you can change the sheets on a regular basis. This toddler bed foam mattress is water-repellent but, since the cover isn’t removable, you need to exercise caution in regards to messes, especially the liquid variety. As such, clean messes ASAP. Secondly, consider investing in a separate mattress cover for added protection. Even the best water-resistant mattresses can allow fluids to seep. This is especially true if there is lots of fluid involved, the fluid is acidic (like fruit juice), or it is allowed to sit there for an extended period of time. The Graco toddler bed is said to be water-repellent, which may not be as strong as water-proof or water-resistant. Accordingly, exercise extra caution when it comes to spills and messes, especially the liquid variety. Consider investing in a water-resistant, stain resistant mattress cover—it will be well worth it. The Graco crib mattress comes with a fire-proof cover that is removable. Follow directions provided by the manufacturer as to manage and make the best use of this added protection. After taking the Graco bed out of its protective plastic wrapping, lay it flat on a clean, clear surface. You can then literally watch it expand before your very eyes. The process can be slow, though, so it may be the equivalent of watching grass grow after a while.Your mattress will need about 72 hours to fully expand—so, plan accordingly. The Graco baby mattress weighs only 7 lbs. and it measures 52 by 27.6 by 5 inches. Keep these dimensions in mind when deciding if the crib/toddler bed you own is ideally suited, size-wise, for this mattress. This great toddler bed memory foam mattress sports a water-resistant lining that can help keep your infant dry, clean and comfortable. This mattress is made using anti-microbial and anti-static substances; it is also free from lead and phthalates, which should help add to your peace of mind. Finally, this mattress meets standards on flammability set by the federal government, and it comes with a 6-year manufacturer’s limited warranty. 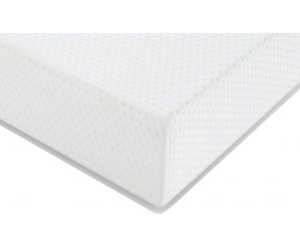 The Graco Premium foam crib mattress is made to fit any US standard sized crib/toddler bed. Find out if that is the type of crib/toddler bed you have before ordering this mattress. 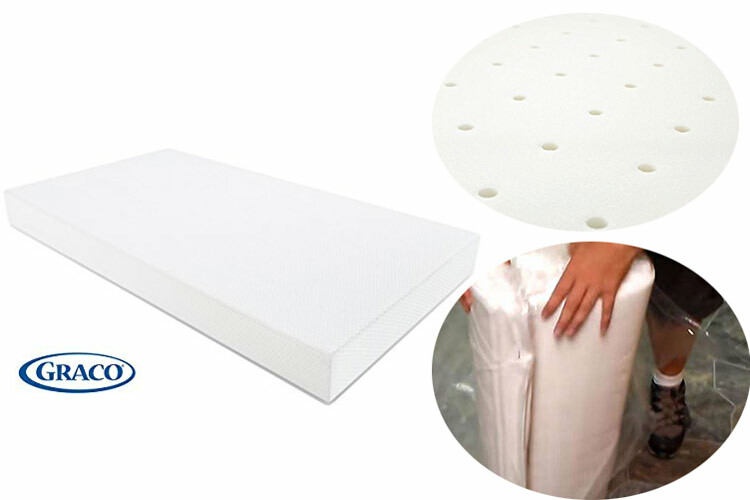 These are some of the things that make this soft toddler bed mattress special: it comes in a relatively small box, easy to carry and deal with, ready to be opened and used by its owner, it only requires from 48 to 72 hours to completely de-compress; it is made using an inner lining that is water-resistant and meant to protect your child’s skin and comfort; it is anti-microbial, anti-static and free from lead and phthalates; and, finally, it’s guaranteed to not have any major manufacturer/functional flaws for a whopping 6 years. If you take care of this convertible crib mattress, it can last you a long time—enough time to take care of one child and, possibly, long enough to use for another child down the road. Not every mattress out there offers a 6 year warranty, if they offer one at all. At any rate, full information about this warranty comes with the mattress and explains what you need to do, should there be some problem with this product. The Graco crib toddler bed is made to be used by infants (as well as toddlers), so the idea of whether it contains too much bounce was no doubt considered by the manufacturer. After all, the last thing a manufacturer wants are complaints and mishaps that may lead to complaints or, worse yet, lawsuits. Accordingly, safety and quality is as important to the manufacturer as it is to you. This toddler cot mattress is firm enough to not create too much bounce; it is also soft enough to provide comfortable, restful sleep. There may be instances when corners on the Graco crib bed may not expand as well as the rest of the mattress—if that happens, you may have to coax the corner in order to help it expand in the right direction. The corners are important because they help the mattress to fit snugly inside a crib or toddler’s bed. Without that snug fit, the mattress may move around as the child tosses and turns or it may leave dangerous gaps that can lead to injuries or things ending up under the mattress that simply don’t belong there. The firmness on the Graco Premium is good enough to provide that resistance kids need to develop strong muscles and good coordination. It provides just enough firmness for an infant and, at the same time, enough comfort for a toddler. This mattress is priced just right for people who don’t want to overspend or who simply need to get the most for the price they pay. The Graco Premium mattress is made for both cribs and toddler beds. It is has just the right balance of firmness and comfort to accommodate both types of sleeping needs. In spite of this mattress being thinner than its competitors, it still has the support, firmness and comfort level that you demand for both your infants and your toddlers. When it comes to foam, though, it’s not a question of how much foam but the quality of the foam being used. Although no mattress can claim to be perfect for every situation and every child out there, this mattress is suited for most situations and most kid. It is firm enough (but not too firm) for an infant and soft and comfortable enough for a toddler. However, really the proof of the pudding is in the eating—in other words, only with use can anyone determine how much a child will like or dislike a mattress. The best that you can do is purchase products with a good reputation and that have the features that are most important to you . . . in other words, buy a Graco Premium. It gives you 5 inches of high-quality, thick, high-breathability foam. This mattress offers that natural breathability that is inherent in many foam-containing products. You also get the added breathability that comes with the cover. This mattress, like most foam-made products, can have some strong scents that you will have to properly manage and allow enough time to leave the mattress. For starters, you need to let the mattress breathe to release the odor—one strategy is to direct a fan unto it as it expands, thereby letting the scent slowly dissipate. You can also put it outside but, if you do, make sure it’s on a dry, unmolested surface, away from critters, the weather, and anyone that might mess with it. Cold weather, by the way, some people say, helps to get rid of the scent. Most mattresses come with some kind of unique scent and whether you or your child will find it unpleasant depends on each individual. The important thing to note here is the fact that the mattress eventually loses most of the strong scent felt at the beginning. The Graco Premium Foam Crib & Toddler Bed Mattress may not have all the bells and whistles of its more expensive competitors and it may not even have all the features that you were looking for but, for the price you’re paying, this mattress offers many admirable and useful benefits. In fact, this mattress is simply good value and a good choice, as the many people who have bought it can testify to.